Instantly refreshes skin and leaves it soothed and soft. Garnier SkinActive's Charcoal and Algae Tea Hydrating and Purifying Tissue Mask infused with a serum enriched with Algae, Hyaluronic Acid for skin that feels purified, comforted and looks mattifieda all in just 15 minutes. 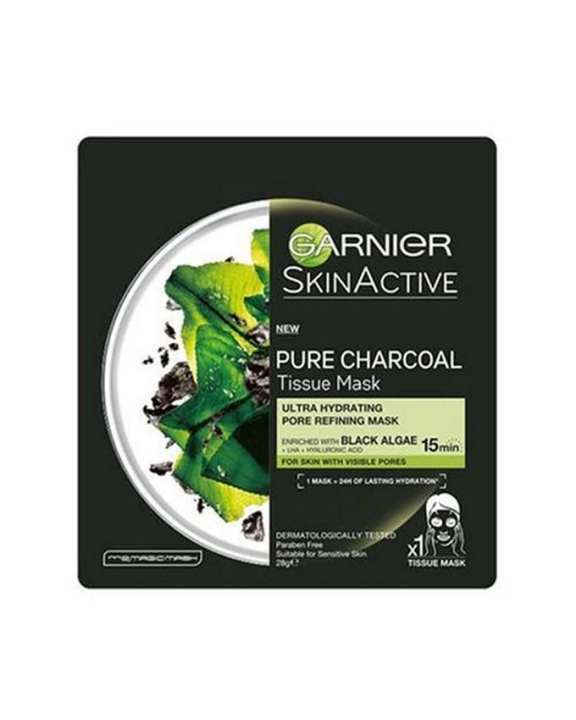 Garnier SkinActive Charcoal and Algae Hydrating Sheet Mask key features include: Dermatologically tested Easy to apply and remove Intensely rehydrates Reduces appearance of fine lines Tightens pores Suitable for sensitive skin How to use Begin by thoroughly cleansing your skin. Gently unfold the mask. Carefully apply the black tissue mask to clean skin. Make sure the protective film is facing outwards. Smooth on gently to ensure the whole mask is in contact with the skin. Remove the protective film. Adjust the contours of the tissue mask to match up with your facial features. Leave on for 15 minutes. After 15 minutes, begin to remove the mask by slowly peeling from the edges. Once you’ve removed the mask, massage any excess serum into the skin, or use a cotton pad to remove. is this working only on womens or also for mens?